Claire Hutkins Seda with the Migrant Clinicians Network (MCN) reports about an event held last week with photojournalist Earl Dotter. The AFL-CIO’s director of health and safety, Peg Seminario, led a conversation with Dotter for a gathering of environmental and occupational health advocates. MCN’s director of environmental and occupational health, Amy Liebman, was one of many who attended the event. “I came of age professionally in the worker health and safety movement with Earl Dotter’s images, bringing to life, in often painful ways, worker struggles and reinforcing the ongoing need to carry on the fight for worker safety,” Liebman remarked. Liebman wrote an introduction to the chapter titled, “WORK. RESPECT. DIGNITY. Shared Images and Stories of Maryland’s Eastern Shore Immigrants, 2014.” She describes venturing with Dotter to meet with workers in the crab houses on Crisfield and Hoopers Island, the watermelon fields near Delaware, and to the homes of construction and nursery workers in Salisbury, Maryland. “It was an incredible moment – to see the workers and their families take in their own images displayed in an effort to showcase the value they offer our region. 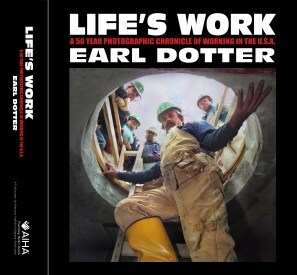 LIFE’S WORK, A Fifty Year Photographic Chronicle of Working in the USA has 15 chapters, including photographs from 1968 when Dotter first captured images of coal miners in West Virginia. Dairy workers, healthcare workers, Native American workers, poultry workers, and emergency responders at Ground Zero are just some of the images in the photo collection. Complementing each chapter are brief commentaries by 30 occupational health and safety experts and writers, including former MSHA chief, Davitt McAteer; Jane Lipscomb, professor, University of Maryland School of Nursing and Medicine; former OSHA chief, David Michaels; and Howard Berkes of National Public Radio. I’m eager to buy a copy and design a way to use it in the classroom. We had traditionally given his previous book (The Quiet Sickness) as a graduation present to our OM residents completing training. Happy to see we can start again with this new one. Thanks for recognizing his incredible work. So glad there’s a book out compiling his art. His mining photos are extremely powerful.